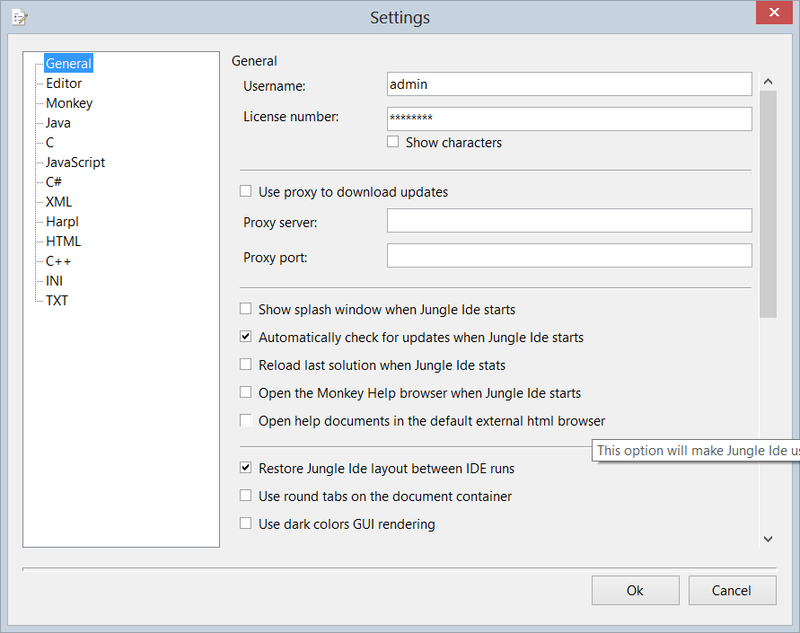 In this Seettings page, you can configure all the Jungle Ide general settings. The username at JungleIde.com This parameter is required to get latst updates for Jungle Ide. If you’re using the LITE or DEMO version, this option is ignored. Enter here your Jungle Ide license number. This is the license number or activation code that was provided to you when you purchased Jungle Ide. Enable this checkbox if you’re behind a proxy server. Jungle Ide can be configured to properly get updates when your computer is behind a proxy. To do so, just check this option. If your computer is behind a proxy server, write here the proxy server address in your LAN in order for Jungle Ide to find it and be able to download updates. This option is only required for users behind a proxy server, and require the option “Use Proxy to download updates” to be active. If you check this option, Jungle Ide will show a default Splash screen window when it launches. This splash window is usually used to show something while an application is being loaded, but Jungle Ide loads almost instantly, so this option is off by default. Jungle Ide is ready to self-update when a fix or new version is available. This can be done manually from the Help menu of the IDE, or automatically at startup, as a background process, when the IDE launches. When this is enabled, whenever an update is available, Jungle Ide will show a notification window and will provide a convenient dialog to automatically apply the update. Jungle Ide can be configured to automatically reload latest opened solution when the IDE is restarted. To enable this option just enable this setting. This option will make Jungle Ide show the Monkey language help window when the IDE starts. This is very useful for Monkey newcomers. Enable this option to make Jungle Ide use your desired external HTML browser instead of the built-in one. The built-in one uses Internet Explorer 9 as its basis so it is able to show advanced contents. This option will make Jungle Ide to restore its complete graphical user interface layout between runs fo the IDE. So when you open Jungle Ide, all panels, are in the same location they where last time you used the IDE. Select this option to make Jungle Ide to use old Jungle Ide skin round tabs on the document container area of the IDE. Select this option to make Jungle Ide render its layout using a darker color scheme. Folders starting with a dot are usually considered “hidden” folders, and are widely used on version control systems. This folders should not be modified from the IDE, so they are hidden by default. By enabling this option, Jungle Ide will use the internal NTFS file ID of each file to compare files equality, so different paths pointing to the same file will not cause any file being opened twice. This is only useful on system with SymLinks on their NTFS file system. Also, notice that resolving this FileID on network drives is a very slow operation. Select here the way Jungle Ide should handle Build All calls on a Solution. By default only main project is built. Jungle Ide allows you to select a custom defined folder as its temporary folder. This is useful if you’re working with targets that do not accept the “space” character in its documents path, such as the Android SDK target. This font selection combo box allows you to select the font used by Jungle Ide in order to display all console texts. It is recommended to select a fixed width font for this window, as it will keep nice formatting of compiler generated output text. This setting lets you set the Console Font text size. If you enable this option, Jungle Ide will reuse any closed connection instead of creating a new one everytime a build operation is performed on a given file. Select this to let Jungle Ide kill any running connection before recycling it. This will prevent Jungle Ide instantiate several instances of the same build process if F5 is pressed twice. Prevents any connection from using more than 3/4 of the available phisical RAM. This is very useful when debugging non inmediate GC targets such as GLFW or stdcpp. This is a safety option but it’s quite CPU heavy, so it is disabled by default. The local shortcuts tree can show the contents of all open files, or the contents of the currently selected file. You can configure this by checking/unchecking this feature.